Mr Nimish Kapoor is a science communicator and scientist working in Vigyan Prasar, an autonomous organisation of the Department of Science & Technology, Govt. of India from last 14 years. At present he is heading Science Films Division of Vigyan Prasar. His work profile includes designing, planning & coordination of national and international science film festivals and capacity building programmes on various aspects of S&T communication. He designed a series of national workshops on science film making for budding film makers and ICT based workshop ‘Cinema in Classroom’ for teachers to promote science films in school education. These workshops are nurturing young talents in the arena of science film making. 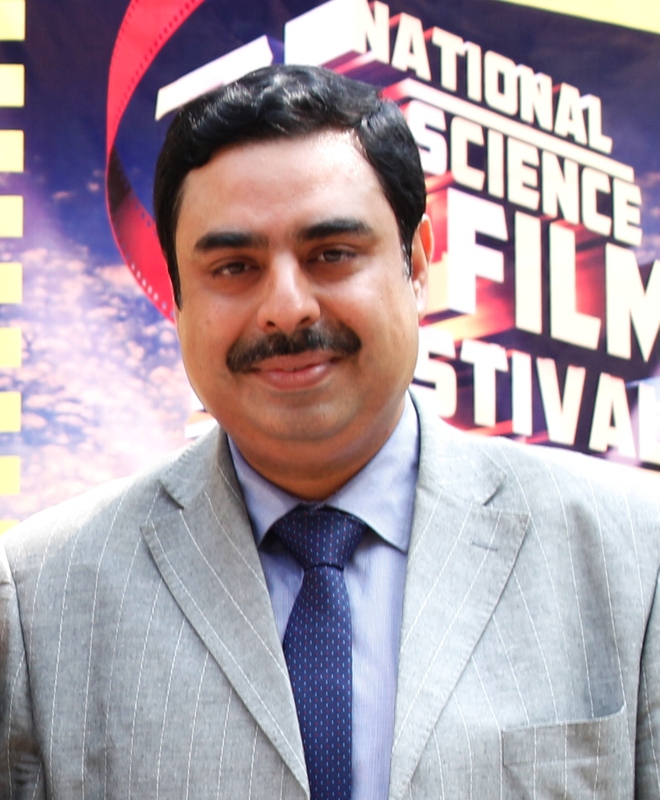 Actively involved in programmes to promote science film culture and science film education and capacity building in the country, he has been part of decision-making bodies of Doordarshan Directorate General, New Delhi; CSTT-MHRD; CIET-NCERT; CMS Vatavaran Film Festivals; Central Hindi Directorate, TERI, NCSTC-DST etc. and associated as resource person and guest faculty in many institutions. Earlier to Vigyan Prasar he has been associated with various television channels as anchor, writer, reporter and producer. Associated with launching team of ETV UP, a regional channel of Ramoji Film City, Hyderabad; produced & directed approx. 1000 hours television programmes for ETV Network (2001-2004); research and reporting for science and society based TV programmes DASTAK and India’s Most Wanted aired by ZEE TV (2000-2001); anchored evening live shows of DD National, talk shows of DD Kisan and written scripts for scientific and environmental themes for fiction and non-fiction programmes aired by Doordarshan & All India Radio; scripted documentaries for Discovery Channel (1998-2001). Presented / moderated live science programmes on All India Radio-News Service Division, national & international broadcasts, FM Gold, FM Rainbow etc. Science films (scripted) were aired by DD National, DD Lucknow and science radio plays aired by Vividh Bharati. Regular contributor of popular science articles to Vigyan Pragati, Avishkaar and Kurukshetra (monthly magazines). Chapters and review papers on various aspects of science communication have been published in national and international journals / books. Mr Kapoor got recognitions in the field of popular science & environmental communication: (i) Gold Medal 1997 by Lucknow Christian College (ii) Dr. Gorakh Prasad Memorial Award 2000 by Vigyan Parishad Prayag (iii) ISWA National Award 2001 by Indian Science Writers’ Association, New Delhi (iv) Bioved Best Journalist Award 2010 by Bioved Society (v) Vigyan Chetna Samman 2012 and 2013 by Vigyan Chetna Samiti, Uttar Pradesh (vi) Vigyan Parishad Centenary Award 2013 by Vigyan Parishad Prayag (vii) Distinguished Service Award 2013 by the Society of Biological Sciences and Rural Development, Allahabad.